The 1983 film A Christmas Story, narrated and co-written by Jean Shepherd and based partly on his own childhood experiences, would grow to become one of the most popular Christmas movies of all time. In 2012 a new musical adaptation (book by Joseph Robinette with music and lyrics by Benj Pasek and Justin Paul) hit Broadway, receiving a Tony nomination for Best Musical. 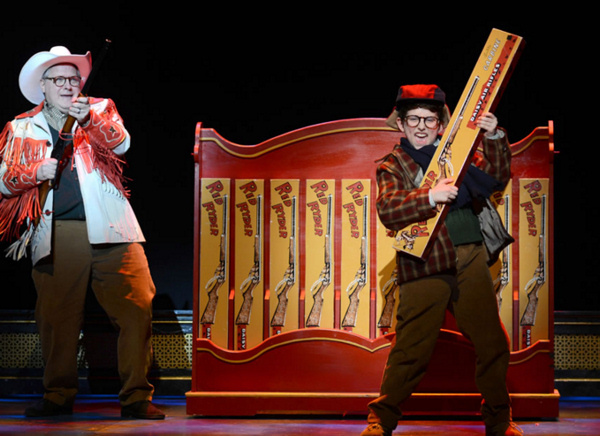 Ralphie�s desperate Christmas quest for a Red Ryder Carbine Action BB Gun includes songs such as Sticky Situation (triple-dog dare about licking an icy pole), A Major Award (over The Old Man�s fishnet-stocking leg lamp award) and, of course, You�ll Shoot Your Eye Out. The result is a fun and charming addition to holiday stages. 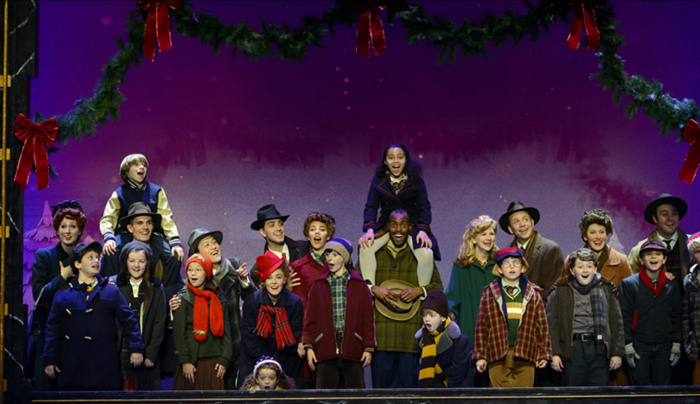 The national tour by Big League Productions comes this Thanksgiving week to ASU Gammage in Tempe, and audiences will be grateful to the team for some casting perfection that includes about as many youth as adults. A lovable Chris Carsten is our narrator Jean Shepherd, giddily reflecting on the events of his childhood like an eternal kid at heart and with a style reminiscent of the movie narrator. 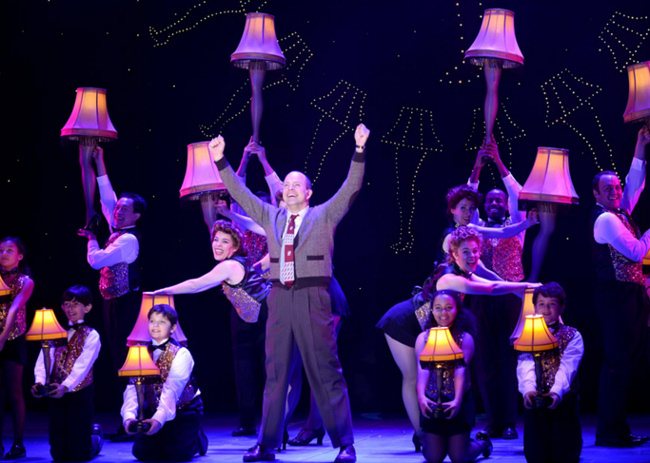 Christopher Swan is The Old Man cursing a blue streak with the amusingly censored faux profanity and delivering over-the-top delight at his fra-geel-ay lady leg lamp that blooms into the big song-and-dance celebration of A Major Award complete with unique kickline � one of the many great examples of Warren Carlyle�s clever choreography that adds much throughout. 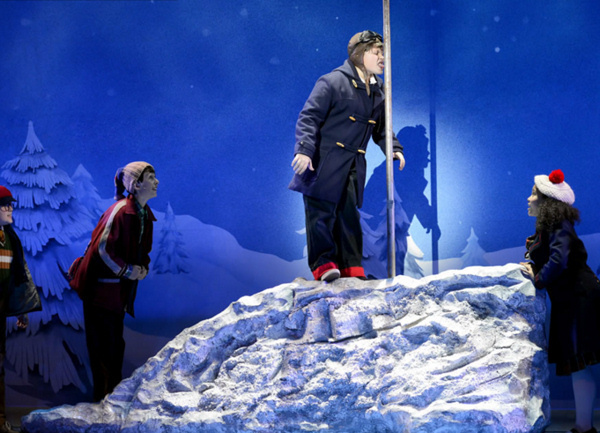 The madcap misadventures of Ralphie�s Christmas don�t overwhelm the warm heart of the show, and Susannah Jones as Mother sees to that. She�s a remarkable actress and singer who has a natural, understated motherly humor and captures the nexus of love and nostalgia that inspired the story with her heartfelt song about fleeting moments in Just Like That. The production boasts a fantastic collection of youth performers drawn from all over the country. 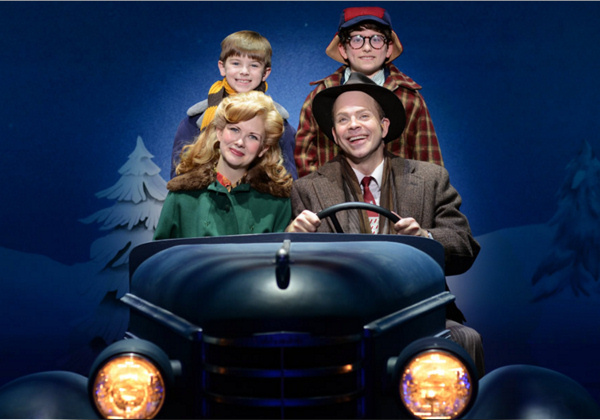 The role of Ralphie is split between Dylan Boyd and Myles Moore, with Myles performing on opening night. 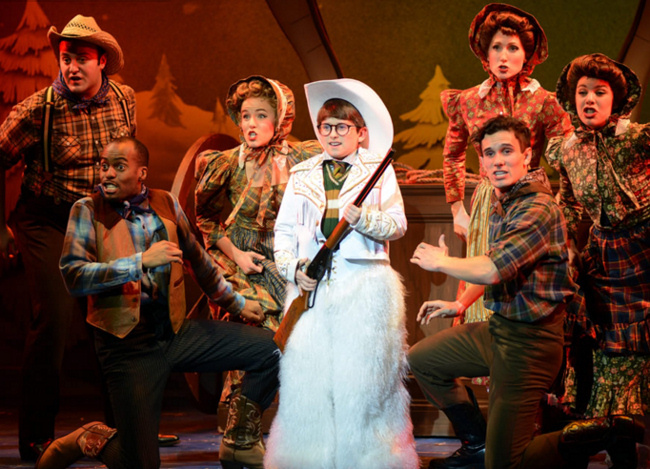 He easily shoulders the main character of the show with his charisma, timing, and impressive singing range from his Red Ryder Carbine Action BB Gun duet with Jean Shepherd to leading the big Ralphie to the Rescue! daydream. Also shining are Josh Turchin as little brother Randy, Christian Dell �Edera as the daring licker of ice, Brandon Szep and Seth Judice as the schoolyard bullies (with Seth also putting on a dazzling tap solo), as well as Johnny Marx, Dylan Boyd, Caroline Howard, Josh Davis, Sophia Pargas, Sydney Chan, and Tierney Lee Howard. Their acting, singing, and dancing add amazing energy and humor in the classroom, on the playground, and around town as Christmas and Santa draw ever nearer. 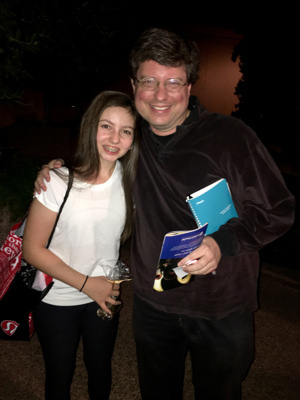 The touring group adds a local youth performer to their show at each stop, and in this case highly experienced local performers Riley Glick (How the Grinch Stole Christmas tour) and Ross Nemeth (Beauty and the Beast tour) join in on different nights. 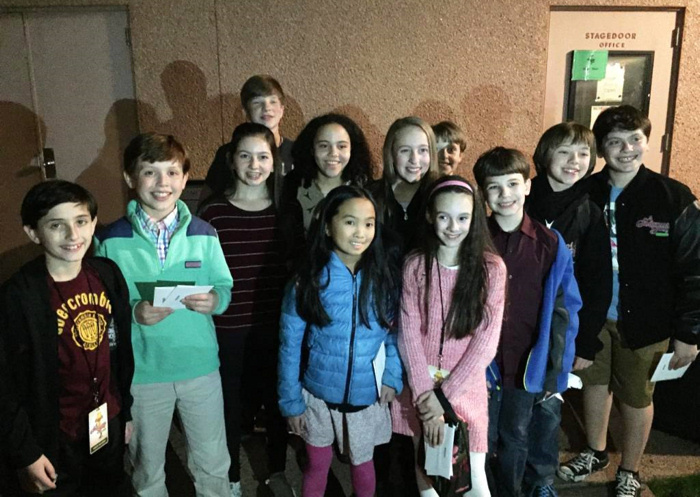 With just a couple hours of rehearsal in the hours leading up to opening night, Riley jumped in to several scenes and nailed them along with the talented regulars. Rounding out the rest of it is a tip-top cast of adults (plus a couple of neighbor dogs) who get the most out of each scene and shine in a wide variety of smaller roles. Their dancing and individual personalities enliven and flesh out the show. They include Brooke Martino as the dance captain, Daniel Smith as the mall Santa Claus, with Deanna Ott and Nikhil Saboo standing out as his lively elves. 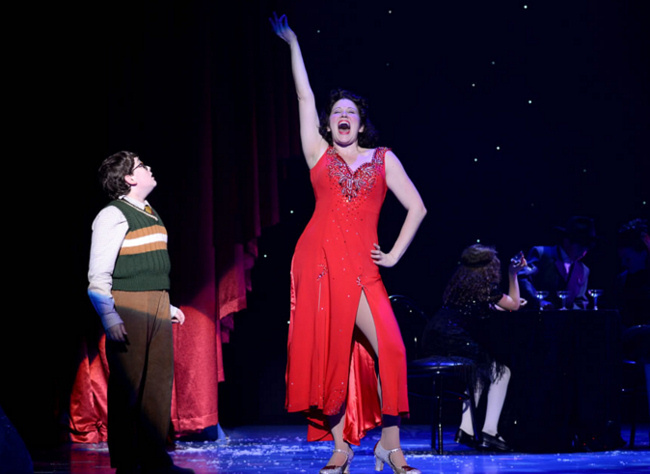 And Avital Asuleen is a hilarious dynamo as teacher Miss Shields who sheds her mundane teacher dress to sizzle in a snazzy red gown while leading her classroom of kids in a Depression-era speakeasy show-stopping daydream of You�ll Shoot Your Eye Out.